“Together, we will make a difference…” is the sole mantra of the Motif Charity Walk, organized by Motif since the last 16 years. Continually aiming to help those who have no means except hope and putting in efforts to ensure that justice is delivered to millions of poor and marginalized people, this walk, each year, identifies new trusts who benefit out of the charity amount. The journey so far has been – 64,677 walkers, 250 sponsors, raised Rupees 5.77 crores and associated with 47 NGOs. This year, it has been 4,090 participants with a total of Rs 74.56 lakh raised for four beneficiary NGOs. 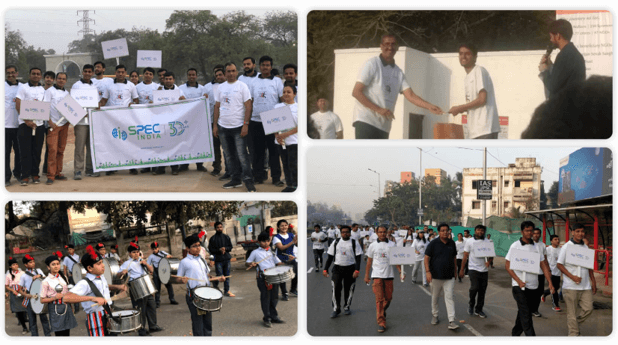 As a part of corporate social responsibilities and with a strong belief of giving back to society, SPEC INDIA has been one of the patron sponsors of the Motif Charity Walk. Over the last 10 years, it has been one of the largest contributors and principal sponsors for this wonderful event. The 16th charity walk, this year, happened on Sunday – the 18th of February 2018. It was a 4 km – 7.5 km run from the L D College of Engineering. SPEC INDIA feels elated to have had over 60 participants showcasing a lot of enthusiasm, in the wee hours of the morning, with SPEC INDIA’s banners all the way. Our excited SPECalites were holding organization banners and placards, walking enthusiastically with music and dance performances around, adding to the fun. Winners of the running competition were given awards and there was poetry recitation about the charity cause and its significance, by our respected CTO. Thoughtful of the corporate responsibilities that we hold, it has always been our persistent effort to participate in many such CSR activities and we look forward to more. Three cheers to our SPEC INDIA team who participated in this Motif Charity Walk!!! Visit https://www.spec-india.com/about-us/corporate-social-responsibilities/ to go through our CSR activities.